On July 3, 2017, two members of an underground house church in Yuncheng city, Shanxi Province were arrested by the police on their way home from sharing the Gospel in Xinjiang County, Yuncheng City. They were then put into a detention center and have not been released. The family of one of them is not allowed to visit her in detention. Around 6 p.m. that day, Li Qinglan (48) from Tongcheng town in Wenxi County, Yuncheng and Chen Xiufang (54) from Huzhang township, Xia County, Yuncheng, were on their way back home from Xinjiang County when they were intercepted by the Chinese Communist Party police. Li Qinglan’s husband Guo Laifu (50) said that before her arrest, at around noon on July 3, 2017, he was resting at home when someone knocked on the door. He opened the door, and five or six officers from the Xinjiang County Yangwang town police station burst inside, led by the village director. They inquired about Li Qinglan’s whereabouts and when she was coming home, telling Guo Laifu sternly, “Your wife believes in God and is disruptive to social order; she has to follow us to the police station.” Mr. Guo said he did not know where his wife was. They then searched the house, taking away fourteen items, including a copier and a Bible. 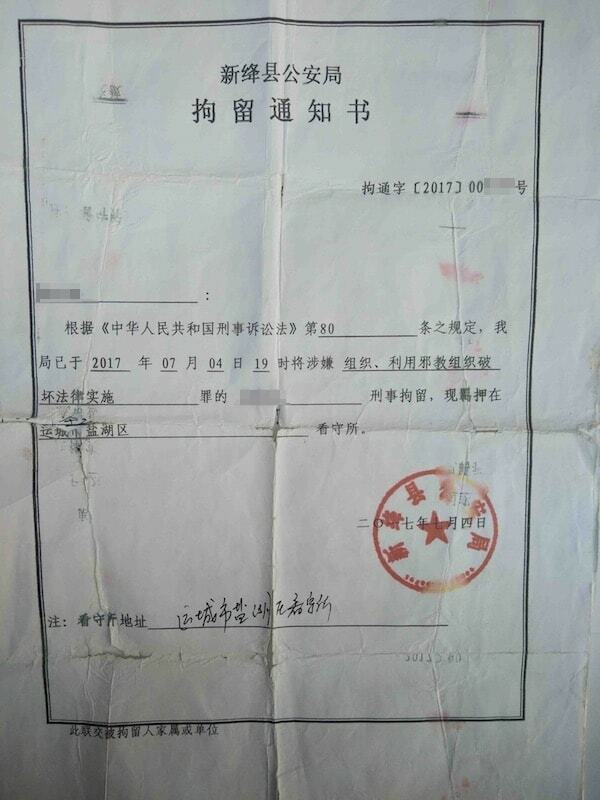 On August 12, 2017, Mr. Guo received a “Notification of Arrest” from the Xinjiang County Public Security Bureau saying that the People’s Procuratorate of Xinjiang County had approved the arrest of Li Qinglan on suspicious of “organizing and using a xie jiao organization to undermine the enforcement of the law.” The Chinese government calls xie jiao religious movements, the teachings of which are listed by the government as “heterodox” in a periodically updated list. In November, her husband and younger sister went to the Yanhu District Detention Center to see her, but the police did not allow the visit. Li Qinglan is still locked up there, and the court has done nothing on this case. Ever since Chen Xiufang’s arrest, her husband has been trying to use connections to get her out, but the police still have not released her. The names of the people are pseudonyms.